Well, I purchased a bottle of Stone’s Enjoy By IPA and placed it in the beer fridge without paying a whole lot of attention to its location. Apparently, the label didn’t really sink in either. So, on 04/20/14, I cracked open the Enjoy By 02/14/14 IPA and split the bomber with G-LO. His first comment questioned my ability to read; not just the big letters on the bottle but my actual ability to read. His next comment concerned his reluctance to participate in the review as he wondered what a “fresh” bottle might taste like. His final comment revolved around his love of West Coast beers and how this old, dated bottle with questionable handling might ruin that for him. At this point, I once again confirmed that I need to put up a bigger fence. Anyway, I am a big fan of Stone Brewing and was intrigued by the pretty bottle with the scripted lettering. I guess I should have taken the label seriously and drank it immediately but my procrastination knows no bounds. Aroma: Sweet (like honey), citrus and a little hoppy. Taste: A bit syrupy with a fair amount of sweetness (cane sugar) and a faint, hoppy and bitter finish. 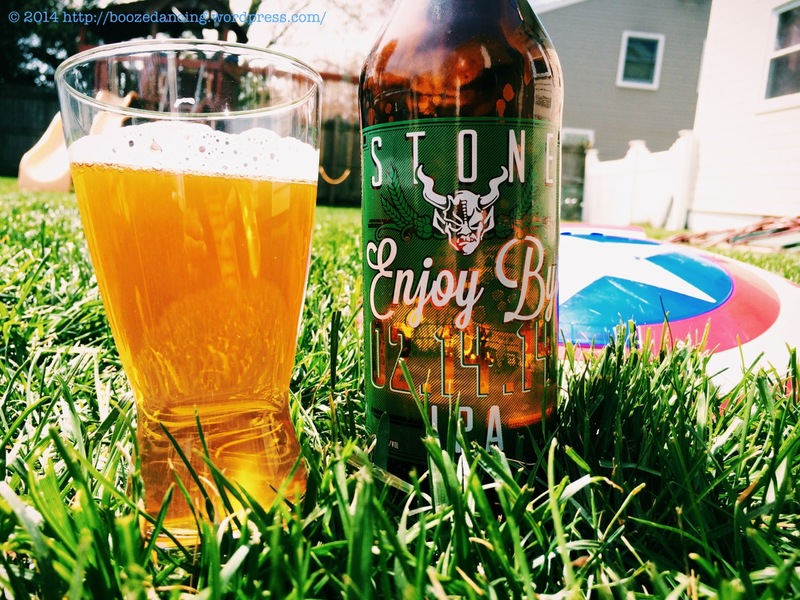 Overall, I found the Enjoy By IPA to be quite refreshing and easy drinking. I’m not sure if the bottle lost a little of its character drinking it over two months beyond the Enjoy By date, but I liked it. If that was your first Enjoy By, I highly recommend getting the next (fresh) one when it comes out and drinking it that day. It seems ridiculous that two months makes that much difference, but it does. A fresh Enjoy By is one of the best IPAs money can buy. They can’t tell you when to enjoy it by, dammit. You’ll enjoy it when you’re damn well ready to enjoy it, and that happened to be 04.20.14. Nobody is the boss of Booze Dancing! They might not be the boss of Booze Dancing, but we know that the Benevolents are! I’ve actually tried this one. I dug it too. Nice pick. I think each one is different but one of the ones I had was VERY hop floral. I did not taste much sweetness but that could have been a later addition. Shhhhh, don’t let on that Enjoy By can be enjoyed after its date….that’s an underground Illuminate secret.